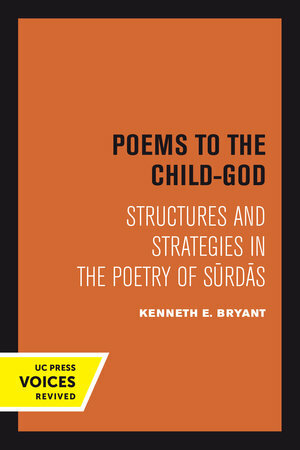 Poems to the Child-God is the first full-length study in English of the verse of Surdas, or Sur, traditionally ranked among the three greatest poets writing in Hindi. Combining introduction, critical study, and annotated translation in a single volume, this work introduces the general reader to a major sixteenth-century mystic poet, best known for his lyrics in praise of the child-god Krsna (Krishna), and proposes, to both specialists and general readers, a way of reading Sur's verse significantly different from that found in traditional critical approaches. A general introduction provides an overview of the poet’s life and time, the religious and literary milieu that informed his work, and the mythology associated with his chosen deity, Krsna. Part 1 looks closely at individual verses from the Sursagar, examining the ways in which the poet manipulates the structures of language, poetic convention, and mythology to develop a theme central to the literature of Krsna-worship: the irony of incarnation. It is, Bryant argues, the irony of a child who never stops growing, beyond manhood and into godhood, seldom glimpsing the still more awesome truth: that he is and has always been the source and substance of the universe. Part 2 presents an anthology of Sur’s verse in English translation. The poems have been arranged to portray the Krsna tale as Sur understood it. Sectional introductions provide the reader with the classical outlines of the tale and point out where the poet made alterations or embellishments of his own. A set of notes on the translations, and a glossary of potentially unfamiliar terms and characters, further assist the Western reader in approaching the work of a major figure in the religious and literary history of India. This title is part of UC Press's Voices Revived program, which commemorates University of California Press’s mission to seek out and cultivate the brightest minds and give them voice, reach, and impact. Drawing on a backlist dating to 1893, Voices Revived makes high-quality, peer-reviewed scholarship accessible once again using print-on-demand technology. This title was originally published in 1978. Kenneth E. Bryant is Associate Professor Emeritus in Asian Studies at the University of British Columbia.